Finance minister Mthuli Ncube's recent pronouncements that Zimbabwe will revert to using its own currency, a decade after it abandoned the local dollar in favour of a basket of currencies is not feasible unless macro-economic fundamentals are addressed. Ncube last week said Zimbabwe will introduce its own currency within the next 12 months as part of a raft of measures to arrest the economic meltdown. "On the issue of raising enough foreign currency to introduce the new currency, we are on our way already, give us months, not years," Ncube said ahead of his trip to Davos, Switzerland, to attend the World Economic Forum next week. This would entail abandoning the bond currency, which has rapidly lost value against the United States dollar on the thriving parallel market. Critics have been quick to shoot down Ncube's proposal, saying if the local currency is brought back, it would suffer the same fate as the bond note, which has rapidly lost value against the greenback despite the rather strange insistence by government that the surrogate currency still traded at par with the firming US dollar. The bond notes have been equated to the now defunct Zimbabwean dollar, evoking nightmares of the 2008 hyperinflation and economic ruin. Back then, inflation peaked to a record high 79 600 000 000% per month, forcing the authorities in Harare to abandon the local dollar. Introducing the bond note was also viewed as government's attempt to print local currency via the backdoor and fund its ballooning civil service wage bill currently gobbling up about 90% of its revenue. That is even expected to widen an already yawning budget deficit. Ironically, although the government insists that the fiat currency is trading at par with the US dollar, President Emmerson Mnangagwa last week announced new fuel prices pegged in varying currencies but for the same quantities -- in a clear admission that the bond currency, derisively known as "zollars" or "bollars", was inferior to the greenback, among other currencies of choice. Even before then, the surrogate currency had been gradually depreciating against the greenback since inception in 2015, before it hurtled to a predicted crash against the US dollar. This is after Ncube had announced a raft of austerity measures, which he used to reassure the nation that it was the remedy to the deep-seated economic malaise. As effects of austerity measures begin to set in, it is becoming clear to all and sundry that the two currencies are not trading pari passu. It is worth noting that the same conditions which are existing now are similar to the same deficiencies which existed when Zimbabwe abandoned its local currency in 2008 at the height of the hyperinflationary era. Back then, inflation soared to unprecedented levels. What triggered the spectacular collapse of the Zimbabwean dollar in 1997, on a day infamously known now as "Black Friday" was a culmination of government's reckless spending, punctuated by the decision to award each of the veterans of the 1970s liberation struggle ZW$50 000 which had not been budgeted for. In the preceding year, the then president Robert Mugabe, without parliamentary approval, deployed the military in the Democratic Republic of Congo (DRC) to secure the presidency of the late Desire Kabila who was under siege from rebel movements supported by Rwanda. The then defence minister, Moven Mahachi, famously retorted: "We cannot sustain expenditure of this magnitude." A decade later, Zimbabwe's weak macro-economic environment, characterised by dwindling exports, government's reckless spending, a ballooning domestic debt, inflationary pressures and low industrial productivity, among a myriad of evils, saw Harare abandon the local dollar in favour of currencies of choice in 2008. The same conditions exist now. Inflation quickened from 31% in November to 42% in December. And, while the argument for reintroducing the local dollar is plausible, the prevailing macro-economic environment would not support the initiative. The reintroduction of the local dollar cannot be done in months, let alone in the prevailing macro-economic environment. The country is trapped in a similarly intractable economic crisis. A case of a step forward and two steps backwards. With official inflation hovering around 42,1% (although economist Steve Hanke puts it at 235%), an acute foreign currency crisis, widening budget deficit (triggered by government's propensity to spend beyond its means), a ballooning domestic debt of US$10 billion and a manufacturing sector that is teetering on the brink of collapse, Zimbabwe's dream to restore its currency-minting status and monetary policy control is doomed and will likely end up like that forgettable 2008 nightmare. Efforts to attract meaningful foreign direct investment (FDI) have been futile. Coupled with that, Zimbabwe's external debt has soared to US$12 billion, dampening prospects of attracting fresh lines of credit from international finance institutions. Zimbabwe's import cover, crucial towards anchoring the reintroduction of the local dollar, is marked at two weeks against the prescribed six-month timeline (Rand Monetary Area requirements). Gold production remains depressed and cannot be used to anchor the proposed currency. 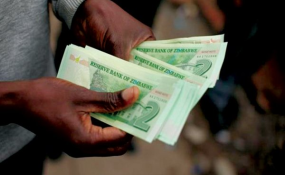 Critics who have advanced the notion against the reintroduction of the local currency under the prevailing circumstances, draw similarities to the same stringent requirements that make it impossible for Zimbabwe to join the rand union although the idea has found traction in some quarters. Some of the requirements that prospective member states should satisfy before joining the elite rand club include firstly having an independent currency and six months' import cover. Bindura University commerce lecturer Felix Chari said it would be the height of fiscal imprudence to reintroduce the local currency in light of the prevailing macro-economic environment. Economist John Robertson said the path towards reintroducing the local currency would require Zimbabwe to first take bold steps such as "firstly restoring the value of land" on the market, a decade after the country rolled out chaotic agrarian reforms that decimated the country's once vibrant agricultural sector. "It would be feasible (to reintroduce the Zimbabwean dollar) if he (Ncube) addresses the key challenges. Firstly he has to put back the land on the market. While the land has no value, it has no collateral. "The other fundamental is for Zimbabwe to attract foreign direct investment (FDI). For now, investors cannot trust government," Robertson said, noting that Harare's hostile investment laws scuttled efforts to attract fresh capital," he said.